Funfetti cake with strawberry, cream cheese, and chocolate frosting. 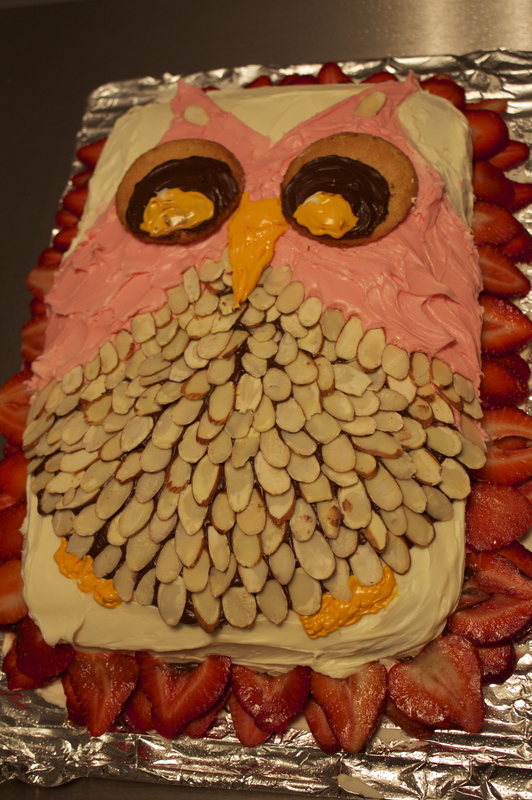 The feathers are almonds, the eyes are macaroons and the yellow is just food colored cream cheese frosting. The final touch of fresh strawberries was delightful. How sweet is he?! I like him a whole bunch; I think I will keep him. Thanks love. I had a fantastic birthday, thanks to my family! Tomorrow pics from our vacay! Not only was it awesome looking….but YUM!!!!! The cake was amazing…VERY crafty and delicious too!! You rock Derek!